I have a few more exciting follow-up items from last week's Ajax Manager WebCast to share with you today. First, all of the code for the demo conducted on the WebCast is now available for download on Joe Stanger's blog. 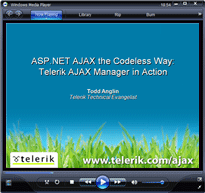 Included in this code is a pre-release CTP of the Telerik Ajax Manager for ASP.NET AJAX. Definitely worth checking out! Second, it seems that the on-demand download of the Ajax Manager WebCast is now working on the Microsoft website. If you use IE, you can use the Live Meeting Replay player for the full replay experience or (like all other browsers) you can download a 15MB WMV file. Jump to 18:45 in the WMV to get to the actual start of the WebCast (the first 18 minutes is just "pre-show" waiting time). If you're interested in downloading the actual PowerPoint slides, you can grab them on Joe's blog, too. Finally, if you asked a question during the Ajax Manager WebCast that did not get answered, make sure you check out the full list of questions and answers Joe posted last week. Joe forwarded all of the unanswered questions to me offline and I provided an answer to all of them. There are about 70 questions (and answers) on the list, so you're likely to find information you're looking for there.